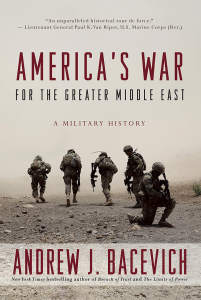 This review could easily list 15 or 20 books on U.S. involvement in the Middle East since 9/11, and most of them would agree with David Kilcullen that the United States should be devoting more resources to the “Global War on Terror.” Andrew Bacevich is far outside the foreign policy consensus in arguing that the United States should simply withdraw from the region because its war cannot be won. Derek Chollet makes the case that Barack Obama has steered a sensible middle course between the binary choices of escalation and withdrawal. That course has been something closer to the Cold War strategy of “containment,” whereby you trust that your enemy will eventually fall victim to its own inner contradictions. But if our hope is that Islamist regimes in the Middle East will come round to liberal or Enlightenment values, we may be in for a long wait. Kilcullen, a former colonel in the Australian army, focuses on the expeditionary wars of the past 15 years against Afghanistan and Iraq. 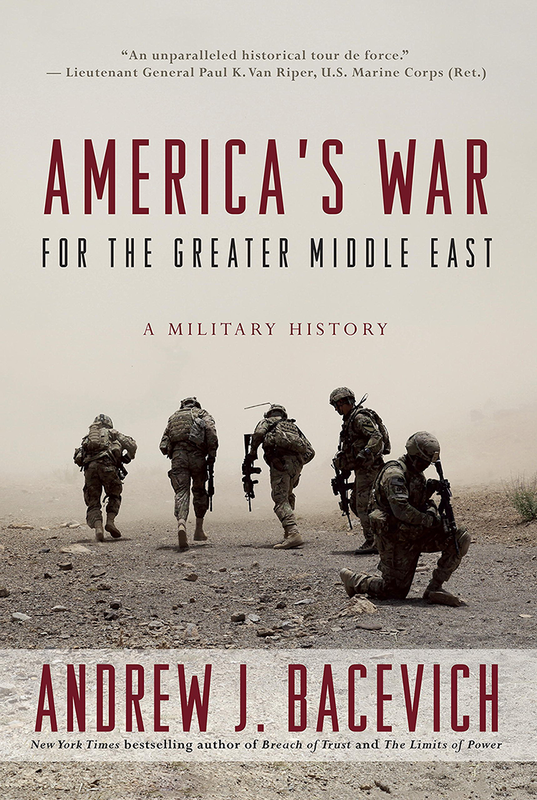 Although he describes Iraq as “the greatest strategic screw-up since Hitler’s invasion of Russia,” he argues that the United States should still be there, and in much greater force. Once you have made the commitment, he writes, you have “only two choices: you can leave early, or you can leave well.” Bacevich, also a retired colonel, views such maxims as excuses for staying indefinitely. He wants the United States to withdraw completely from its project of bing the hegemon of the Middle East. How – and why – did the United States “get in” to begin with? 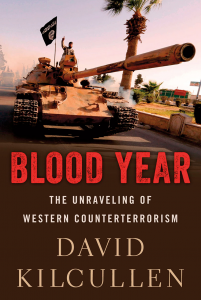 Kilcullen has a strictly military perspective on what he calls “the War on Terrorism since 2001.” Bacevich goes back further, and takes a wider view. Before 1980, he notes, the United States had no significant military presence in the region and suffered few casualties there. Since then, thousands of U.S. soldiers have died in the Middle East (including Bacevich’s son, in 2005), but only a handful everywhere else in the world. What changed? At the beginning of 1979 Ayatollah Khomeini returned to lead the Iranian revolution, and at the end of the year the Soviet 40th Army invaded Afghanistan. The U.S. strategic response was drafted by a mid-rank Pentagon official, Paul Wolfowitz. The United States had a “vital stake in the Persian Gulf,” he wrote, as a result of “our need for Persian Gulf oil and because events in the Persian Gulf affect the Arab-Israeli conflict.” Wolfowitz’s study led to the “Carter Doctrine” of January 1980, which committed the United States to using military force against any outside power that tried to gain control over the Gulf. In 1980, America’s reasons seemed clear enough. It would protect the oil fields and Israel – which aim had priority could be left open to debate – and it would keep the Soviets out. But that a Soviet army might arrive at the Gulf was never credible, since it would have had to advance through the middle of the Iran-Iraq War. Afghanistan was more than enough for the Soviets: about 14,000 of their forces died, and perhaps a million civilians. After ten bloody years Gorbachev fell back on a “Bacevich strategy” of total withdrawal. The United States was left as the region’s sole claimant to primacy. That primacy was promptly challenged by Saddam Hussein’s invasion of Kuwait in August 1990. If he had continued into Saudi Arabia he would have controlled up to half of the world’s reserves of oil, so the United States felt bound to move against him. The First Gulf War was fought on classic Westphalian grounds, to eject a nation-state that had violated its neighbour’s territory. The U.S. plan for the war was “Vietnam done right.” It would commit as many troops as to Vietnam at its peak: 500,000. But instead of being trickled in over years, they would assemble in Saudi Arabia and then strike all at once. The ground war was held off for seven months after Saddam’s invasion, but when it came it was over in a hundred hours. George H.W. Bush had gained a lightning victory; not only that, he had persuaded his allies to pay almost 90 per cent of the war’s cost. Bush stopped the war expecting that Saddam would soon be deposed by his own people. Instead he would cling to power until the Second Gulf War removed him. Thirty-six years after the Carter Doctrine, the United States has not been able to find a consistently successful military or political strategy in the Middle East. The human cost to the United States in Afghanistan and Iraq has been just under 6,000 military deaths (unlike Vietnam, there has been no attempt to count up how many of the enemy, or local civilians, have died). The financial cost has been estimated by Linda Bilmes of Harvard at between $4 and $6 trillion, of which the greater part will be continuing medical and pension costs for veterans. Payments for World War II veterans peaked in the 1980s, so for these recent wars the peak will come around 2050. By then there will be further trillions in interest costs for the deficit financing that paid for the wars. George W. Bush made a shrewd political calculation by actually cutting taxes at the same time as he took the United States into war in Afghanistan and Iraq. Even now, neither Republicans nor Democrats (with the exception of Donald Trump) have shown much concern for the economic burden of U.S. military commitments. But where are we on the war aims defined by Wolfowitz in 1979: “oil and Israel”? Oil has never stopped flowing over the whole period, and the current problem is rather that there is too much of it on offer. Israel, whatever one thinks of its conflict with the Palestinians, is probably more militarily secure and prosperous than at any time since 1948. If the United States remains committed to the Middle East, it is now not so much because it is for something as because it is against something: Islamic fundamentalist terrorism. If this is what the U.S. presence is about, the question becomes one of tactics. Kilcullen gives an impressively detailed account of the multiple state actors and militias, and of Western attempts to bring them under control. Apart from the blitzkrieg of the First Gulf War, the West has vacillated between two doctrines. One is “Counter-Insurgency” (COIN), which overlaps with the state-building ambitions of the neoconservatives. The invading army tries to gain the support of the local people by protecting them from insurgents and improving their everyday lives. Hopefully, a more prosperous, secure and democratic civil society will come to reject the radicals who threaten it. The major COIN initiative in the Middle East in recent years has been the 2007–08 “surge” in Iraq, led by General David Petraeus. It was hailed as a success at the time, but has not proved a lasting one. COIN has always had its opponents within the U.S. Army. It requires more personnel and expense than conventional war, over a longer or even an indefinite period. When occupying soldiers live closer to the people, they will suffer higher casualties. But the principal objection to COIN is that it assumes the local population can be won over to democratic values. Andrew Bacevich notes that when the United States moved into the Middle East in the 1980s it paid little attention to Islam. The main danger seemed to be Pan-Arab socialism and its Soviet patron. But if religion is the core issue, can there be any convergence of interests between the indigenous people and those who come from outside, peddling Enlightenment dogmas? If COIN is doomed to failure by the religious (and linguistic) gulf between East and West, the only alternative strategy becomes Counter-Terror: killing your enemies wherever you can find them, at the lowest possible cost to yourself. Kilcullen, though himself an adviser to General Petraeus on the “surge,” seems to have switched to a Counter-Terror stance in the current struggle against the Islamic State in Iraq and Syria. The United States, he argues, should “go in hard” against the Islamic State with more bombing and more boots on the ground. Counter-Terror means giving up on the hope that the local population will ever come over to your side – because of unbridgeable cultural differences, or internal conflicts such as Sunni versus Shi’i, or collateral damage from the Western way of war. What remains is something like the Israeli model (which to some extent the United States has deliberately imitated). Euphemisms like “price tags” or “mowing the grass” recognize that the aim is to manage rather than resolve the underlying conflict. The paradox of Counter-Terror is summed up in the question asked by General Petraeus: “Tell me how this ends?” Kilcullen believes that going to war in Iraq in 2003 was a huge mistake, and seems to agree with General Michael Flynn that “drones create more terrorists than they kill.” But the War on Terror must go on, Kilcullen affirms, for the reason given by then–Australian Prime Minister John Howard: “It is impossible for a multicultural, maritime trading nation like Australia to be secure in an insecure world.” Or as George W. Bush put it, “We must fight them there before we have to fight them here.” By this reasoning, there is no point in asking how the Middle East wars end. We will be living with them indefinitely. Bacevich rejects out of hand the idea of leadership through force. He believes that an American order in the Middle East is unattainable, and that the costs of even trying to create it are too high. In the long run the region must arrive at its own order, through national and sectarian conflicts that will eventually burn themselves out. Without proclaiming anything so sweeping as a “doctrine,” President Obama has tried to find a middle course between Kilcullen and Bacevich. He has tried to scale down the U.S. military presence and reduce its casualty count through reliance on drones, bombing and Special Forces. Diplomacy has tried to coax Iran into becoming a more liberal and constructive player in the region (which means making it a de facto ally against the Islamic State). Both Kilcullen and Bacevich excoriate Obama for what they see as indecision and half-measures, with Kilcullen complaining that he is doing too little to project American power and Bacevich complaining that he is doing too much. 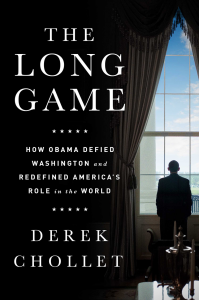 Derek Chollet argues that, given the constraints, Obama’s level of engagement has been about right. He has tried to turn “asymmetric warfare” in his favour: attacking the Islamic State from afar and making it very difficult for them to strike back against his forces. The Islamic State has responded with its own “price tag” campaign, against soft targets in the West. President Trump promises to do more and to do less simultaneously, making it impossible to discern any “Trump doctrine” for the region. But is there any clear path out of the present chaos? And where might Canada fit into such a new order? Perhaps there is a lesson in China’s foreign policy, which has something in common with the commercial anti-imperialism of Richard Cobden in the 19th century. Why waste money on armies and gunboats, Cobden asked, when most countries do not need to be compelled into trade by military force? Why try to rule over the Persian Gulf when there is a global glut of oil and both friends and enemies are eager to sell it to you? Unlike Cobden, China is not motivated by pacifist idealism, but by a cold assessment of costs and benefits. It takes an aggressive posture in its immediate neighbourhood, but everywhere else it projects economic rather than military power. Its focus in the Middle East is to develop the “New Silk Road” between China and Europe. Having already built the high-speed rail line between Ankara and Istanbul, it has just completed a direct rail link to Iran. Urumqi, in western China, is in fact closer to Tehran than Toronto is to Vancouver. Instead of trying to “fix” Afghanistan, China is simply bypassing it through the Stans to the north. The business of China seems to be business. Limited as he is by established interests, Obama has nonetheless edged toward a more “soft power” approach to the Middle East. One model might be the European Union’s success in fostering democracy and economic development in eastern Europe since 1989. This is surely a peaceful achievement on a world-historical scale, even if it is now threatened by the rise of nationalist parties across Europe. A comparable process is under way in the Balkans to resolve the savage ethnic wars of the 1990s. Nicolas Sarkozy also tried – prematurely, as it turned out – to move the Maghreb toward integration with Europe. It may take the rest of this century, but the best hope for the Middle East remains a gradual evolution toward Enlightenment norms, through civil medicine rather than military surgery. If we think of that evolution as an organic process, it will not be furthered by violent interventions from outside. Another limit to U.S. reliance on a military approach is that since 1972 it has been directed against relatively small and weak countries in the Caribbean, Central America and the Middle East. Yet the future of the latter region must hinge on its three major countries: Turkey, Egypt and Iran. Each has about 80 million inhabitants, extensive territory and a diversified economy. No U.S. strategist with a minimum of common sense would be eager to invade them, and no politician would dare to reinstate the draft. That leaves diplomatic, cultural and economic relations as the only feasible means of engagement. In this perspective, there is plenty for Canada to do in the region other than sending troops and warplanes. Nor should we be sending armaments to Saudi Arabia, whose invasion of Yemen is both a crime and a blunder (sadly, with the active support of the United States and Britain). If Canada took as its starting point “first do no harm,” it would still have many ways to relieve the enormous suffering inflicted by the Middle East wars. Between Kilcullen’s “more of the same” and Bacevich’s “walk away,” can Canada find its own middle path?